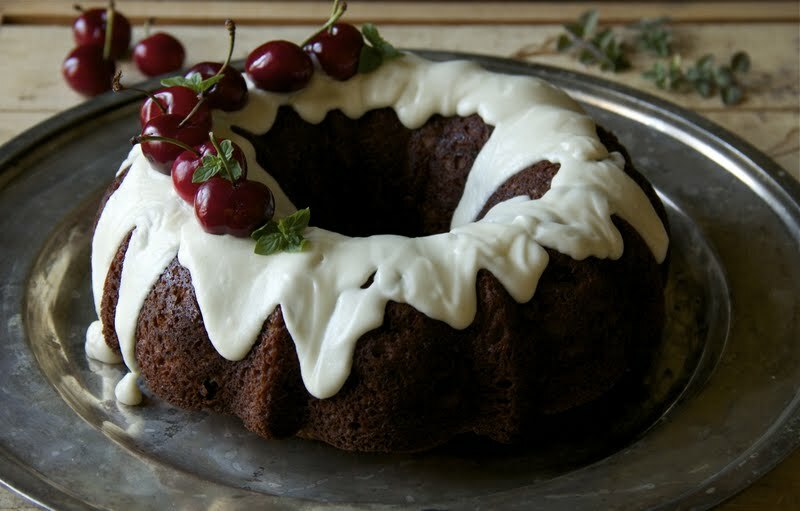 Thyme: Carrot Cake Bundt...with Cherries! Note: I've been nominated for Babble's 50 Top Food Blogs! I have 7 more votes to get into the top 50. So Close!! If you like what I've done here, would you follow the side link to Babble and vote for me? I am on page #2 "Snippets of Thyme"
Company arriving! A sweet weekend to look forward to with delightful relatives coming to visit. Weekends like this put me into full planning mode. Market shopping to anticipate, lists to scribble down, careful selection of fresh ingredients for the season. I need a fairly quick dessert for our weekend guests and planned to make a carrot cake. Actually, it was the desire for cream cheese frosting that was beckoning me. You see, I came across this amazing, simple, creamy, luscious cream cheese frosting the other day. What better than to make it again for carrot cake. What is this that I see at the market! Oooooh. 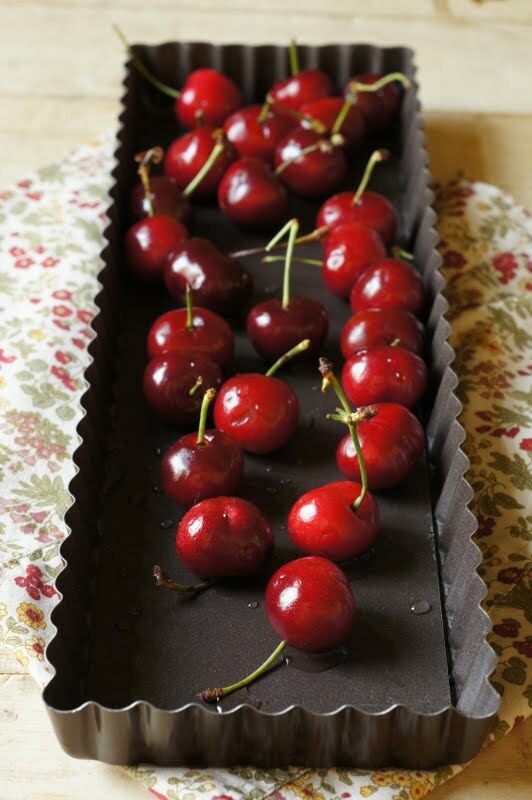 Look at those juicy cherries. 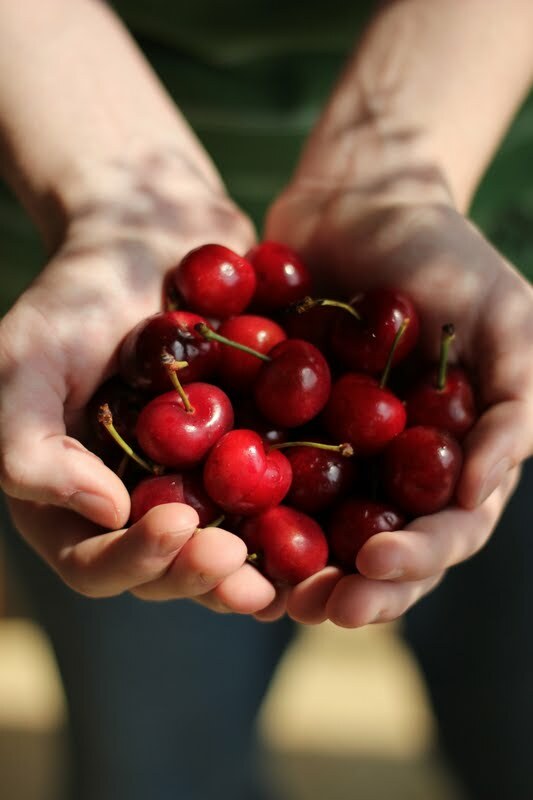 When we lived way up there in Michigan, we had a cherry tree right in our back yard! Who has a cherry tree in their back yard anymore? One summer, Patrick's mother was visiting. She and the children picked bowls and bowls of them. Before long there were jars of cherry jam being made in the kitchen. We still reminisce about that cherry jam and that adorable cherry tree. I decided that somehow cherries had to participate in this carrot cake endeavor (cream cheese frosting endeavor if truth be told) that I had laid out for my myself visiting guests. I arranged them on top of the carrot cake (which now is in bundt form) and spinkled some mint along with them. Why the mint? Because it is just so darn pretty. Combine all dry ingredients. Then add remaining ingredients. Grease your bundt pan. (Snippets Note: great it well if you want a beautiful slide out) Pour ingredients in bundt pan and bake mixture for 60-75 minutes at 350˚ degrees. Do not forget to preheat oven. Serving size: 10. Cream cheese frosting; Cream the cream cheese, butter, vanilla and salt. Gradually add powdered sugar and blend well. Apply icing to the cooled carrot cake and serve.